Samsung Galaxy Note is already become very famous among the users. Now Galaxy Note can be used along with Latest Android OS, Ice Cream Sandwich. Right after releasing the 4.0 ICS update for the AT&T's Galaxy Note, Samsung released Android 4.0.4 update for the international version of Galaxy Note. You can download it both via Kies and OTA. Currently the update is available in Austria, Belgium, France, Germany, Hungary, Italy, Spain and the United Kingdom. Other regions should join this list in the following days as well. 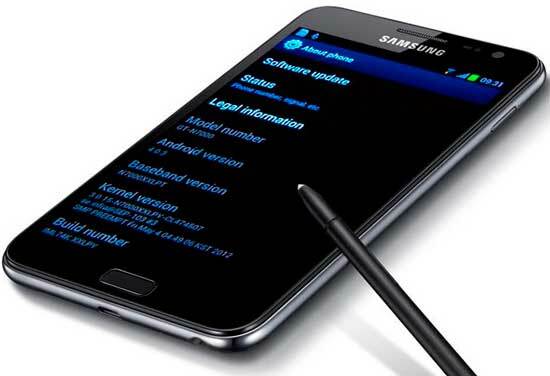 Android 4.0.4 brings many bug fixes to Samsung Galaxy Note. It also adds a few cool new features such as signature unlock and Pop up play. There are also several changes to the UI and icons. Users also reporting change in performance of their Note. And all the reports are positive. If Samsung somehow misses your device for up gradation procedure then you also have bypass facility if you need. You can download Android ICS image for Samsung Galacy Note and flash it via Odin. But you have to make sure that your device isn't affected by the eMMC bug.